Legendary Conductors take the Bandstand Wednesday @ TCMF! Austin — The Texas Community Music Festival shifted to the Farmer’s Market at The Triangle Wednesday night and entertained an enthusiastic crowd of marketgoers and music lovers! 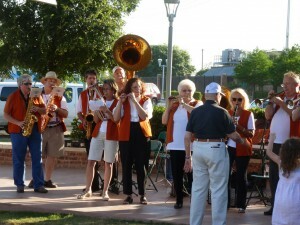 The evening began with a performance by longtime TCMF act the Austin Polka Band and closed with an encore performance of the Chaparral Dixielanders, who played with a record number of musicians to the delight of patrons and vendors alike. In between, TCMF was graced by a short performance by elements of the University of Texas Longhorn Alumni Band (not all 3,700 members, but a few! ), who played some of our all-time UT favorites, including March Grandioso, Wabash Cannonball and of course, The Eyes of Texas and Texas Fight! Highlight of the performance were the two conductors emeritus who conducted the band, Moton Crockett, who conducted the band from 1950-55 and the legendary Vincent R. DiNino, who took the baton in 1955 and conducted the Longhorn Marching Band for the next 20 years. TCMF returns to Central Market Saturday morning at 11:30. Please consult the schedule page for details on performers, locations and performance times. The Texas Community Music Festival is sponsored by H-E-B and Strait Music Company, and is hosted by Central Market and the Austin Civic Wind Ensemble.